Purchase pond dipping equipment to help us explore our pond habitat further, this included pond dipping trays, nets, ID charts and scientific viewing equipment. Install 3 water butts in the school garden, one on our shed in the school pond area, one in the front school garden and one in the side garden (near Year 2 and 3 classrooms) both connected to the down pipes. This has enabled us to capture rainwater for watering the garden and make it easier for children to do watering activities as well as learn about the environmental benefits of capturing rainwater and using on the garden. The water from water butts can now be used to top up the pond in dry weather periods rather than using chlorinated water from the tap which is not good for the pond aquatic ecosystem. Purchase hose pipes and connectors to make watering easier over summer dry periods equipping the school with enough hosing to reach the pond vegetable garden and the front garden when needed and a hose for watering the reception class vegetable garden. Purchase bird feeders and bird feed hangers to feed the birds in the garden over the winter months. Bird and mini beast identification charts have also been purchased to use in our science work around the garden environment. When our bird table is installed we will hand these out for the birds in the pond garden. Purchase extra pairs of garden gloves for use in gardening sessions, kneel pads for using when working on the ground, canes for growing beans, seed markers, and string for use in the vegetable garden, loppers and extra gardening hoes. All the donations we have received to school from parents towards our garden. 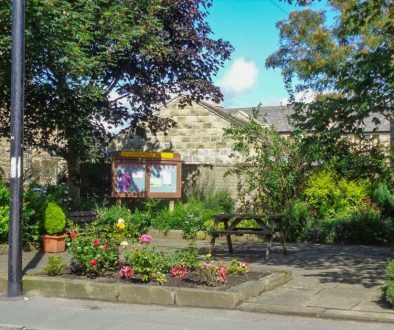 These include a compost bin, plants including; carrots, herbs, wildflower plants for the pond garden, pond plants, sunflowers, poppies, spring bulbs and cosmos all of which have made our garden bloom over the summer months. Parent volunteer time towards helping to run our weekly garden club. 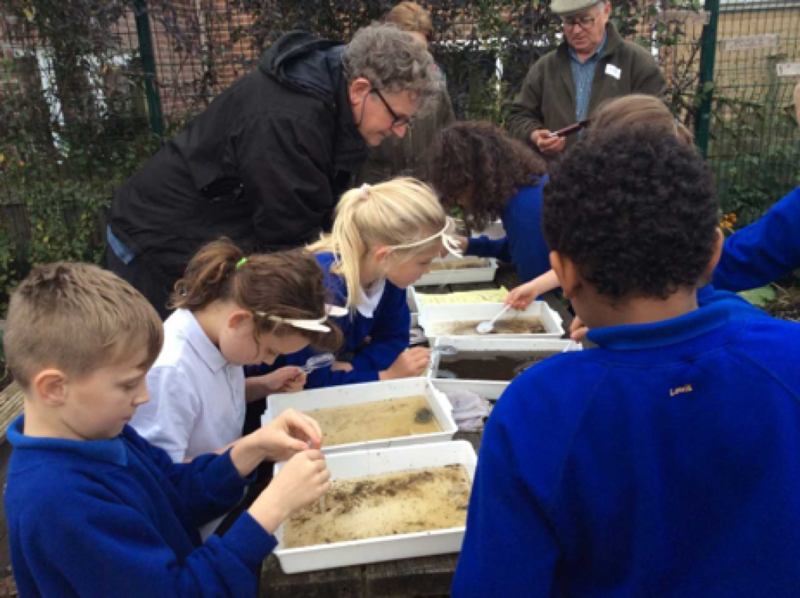 David Wilde’s (Denby Dale Parish Council Countryside Project Officer) and his volunteers Phil and Neil’s time working with Year 5 to get our pond cleared of weed and doing some pond ID work with the children. A parent who has also been making a bird table and this will be installed soon in the pond garden to encourage birds into the garden area for children to learn how to feed the birds and identify different birds and learn the benefits of wildlife friendly gardening. As part of the project we are also running 6 parent/community garden sessions (1 per half term) for parents to engage with vegetable and wildlife friendly gardening. Uptake from parents in these sessions has been poor to date. In our first session (10th July 2017) we invited parents/grandparents to come and join in with garden activities an hour before our regular gardening club and then continue gardening with us as part of the garden club. The vegetable beds were weeded and mulched with straw, the front garden weeded and the gardens watered. In our second session (9th October 2017) for parents and grandparents to join in with garden club activities we planted the front garden with spring bulbs and learnt how to sow and grow microgreens. Garden club sowed radish, spicy salads, beetroot, broccoli and lettuce as microgreens and took them home to grow and enjoy with their families. To engage more parents and children in the next session, we intend to take the session to the Parent and Teacher Association School Festive Fayre on 26th November where we will be having a craft session using willow from the school garden to make Christmas decorations and make apple/fat ball bird feeders for parents and children to take home. To date we have spent £406.82 of the funds. 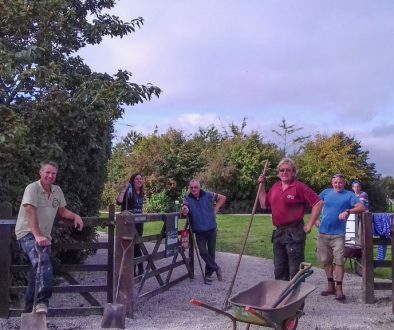 The remainder is committed to bird table materials, purchase of secateurs, plants/spring bulbs for the garden and purchase of materials for the remainder of the 4 parent sessions. 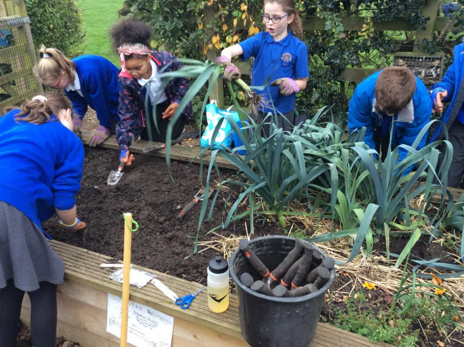 We are very grateful for the grant which is enabling us to develop our gardening project and outdoor learning area for children in our school and supporting our engagement of parents in gardening and food growing.